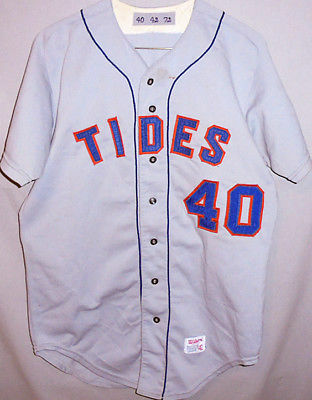 This is a Great, Rare, Vintage Tidewater Tides minor league Game Used baseball uniform jersey. This wonderful Old piece has a Great, Vintage design, with embroidered NY Mets logo, sewn-on letters & numbers (including $40 on the back) and 1972 dated strip tag, is marked "Wilson - Made in USA", an Original, Vintage example, from the 1970's, and is Rare to Find. The Tides were a minor league affiliate of the New York Mets. This is marked Size 42, but actually measures approx. 21" from armpit to armpit and 31" from top to bottom. This appears to be in Very Good, Crisp condition, with some light soiling from use.